Powered by super sophomore Shareka McNeill, Virginia Union is rolling as the CIAA Tournament inches closer. 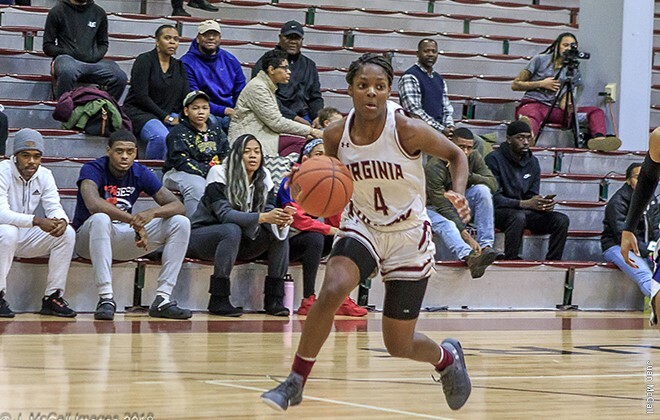 If you are waiting for the Virginia Union women to come down off their position as the top team in the CIAA, you were disappointed again on Saturday. Nationally ranked VUU hosted Chowan on Saturday afternoon and won 55-51. The victory pushed Union’s overall win streak to ten and division streak to five, showing dominance at a great time in the schedule. VUU (19-1, 10-1, 5-0) ended the first quarter up 16-12 over CU (11-10, 7-5, 1-4). Chowan took the second quarter and outscored Union 16-18 to go into halftime with the 28-24 lead. VUU put up 15 points and held CU to 9 points in the third quarter to retake the lead at 39-37. A 9-0 run controlled the first five minutes of the fourth quarter, paving the way for the 55-51 victory. Shareka McNeill led the Lady Panthers in the win with 30 points. Jasmine Carter put up a double-double with 10 points and 11 rebounds. VUU is in great standings, literally and figuratively. For one, the Lady Panthers have not lost since the first week in December 2018. From a national standpoint, the Lady Panthers are twelfth in D2 rankings and their defense is seventh in the nation in points allowed. VUU also has the best record in the CIAA with the top scoring offense, averaging 75.5 points-per-game. This is nothing less than ideal placement with less than a month before the CIAA tournament. McNeill’s explosive performances have also been a huge part of VUU’s success. Averaging just over 22 points-per-game, the Charlotte-native is the top scorer in the CIAA and the twelfth-highest scorer in D2 women’s basketball. Shareka Mcneill scores game-winner in VUU’s 52-51 road win over Bowie State. So with all these accolades, does VUU have a smooth ride to the number one seed in the tournament? As promising as it looks, anything is possible in this final month of play, especially considering how easily the seeds shift due to the standings formula. Not to mention how competitive and unpredictable the division is. Standings are determined first by division percentage, then conference percentage, then overall wins. Union is 5-0 in the north, the only team in the conference undefeated in conference play. Lincoln is hunting close in second place with a 4-1 division record. If LUPA goes unblemished for the next two games and VUU drops one of its next two, LUPA will host a face-off on February 16 to determine the number one seed. That’s a big “if”, though. For now, VUU is showing no signs of slowing down anytime soon and is on the prowl for another CIAA Championship.